Cold One Leg Wraps contain freezable gel & wrap around your horse's cannon & fetlock. They are fantastic at providing cold & compression therapy after exercise or injury. The inner layer of the wraps is made from fine linen, which prevents freeze burning of the skin & cold shock. The center layer is non-toxic, freezable gel, that has incredible cold retention abilities. The outer layer is heavy neoprene, that provides compression, but is still able to stretch. These wraps are a must for anyone wanting effective, easy to use cold therapy for their horse's joints after exercise or injury. There is no messy ice or inserts to deal with & they can be pre-frozen to use whenever you need them. 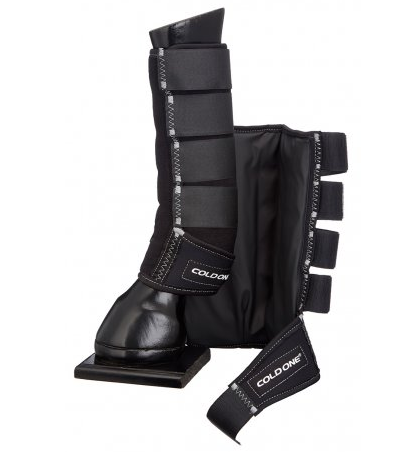 Cold One 4-in-1 Wraps contain freezable gel & are extremely adjustable, so can be used on hocks, hooves, fetlocks & knees. They are fantastic at providing cold & compression therapy after exercise or injury. ProCool Cold Water Boots contain special crystals that swell & become cold when soaked in water. The boots are ideal to provide cold therapy after exercise or injury & are shaped to your horse's lower leg, providing support. Equi-N-Ice Bandages are re-useable, therapeutic bandages that give upto 2 hours of cooling, when applied to your horse's leg. To re-use, simply soak in Equi-N-Ice Recharge (sold separately) for 30 seconds & they?ll be ready to use again for 2 more hours. Horseware Ireland Ice Vibe Vibrating Therapy Boot are a revolutionary product that cool & massage your horse's legs at the same. They can be used after exercise as a preventative or they can be used to treat tendon or ligament injuries or sprains. Horseware Ireland Ice Vibe Vibrating Therapy Hock Boots are a revolutionary product that cool & massage your horse's legs at the same. They can be used after exercise as a preventative or they can be used to treat tendon or ligament injuries or sprains. Horseware Ireland Ice Vibe Vibrating Therapy Knee Boots are a revolutionary product that cool & massage your horse's legs at the same. They can be used after exercise as a preventative or they can be used to treat tendon or ligament injuries or sprains.